There was 3 backup QB’s that won on Sunday, 2 started in Cardinals Drew Stanton & Rams Austin Davis, while Redskins Kirk Cousins came in from the injury to Robert Griffin III. 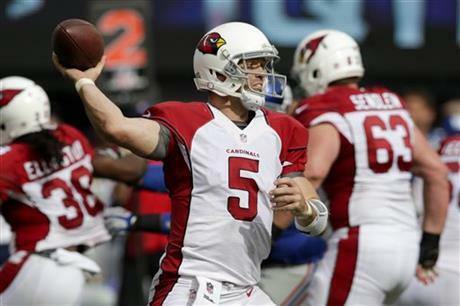 There won’t likely be immediate calls for Drew Stanton to take over for Carson Palmer in Arizona even after a comeback victory at the Giants. The Rams’ Austin Davis was nothing more than an afterthought and possibly headed for the practice squad this summer until Sam Bradford tore up his knee again. Davis’ opportunities figure to blossom more than the chances Stanton will have once Palmer recovers from his shoulder problem.Cousins, however, is one of those guys in reserve who will get a long look while Robert Griffin III is out. The Bills being 2-0, mainly because of good defense, Running Game & EJ Manuel not making a big mistake so far. The Bills have being great of defense, going into Chicago & stopping the Bears Offense & then shutting down the Dolphins, the Chargers come to town on Sunday, can the Bills go 3-0? The Eagles like to come back, they are 2-0 because of it & a little mighty weapon named Darren Sproles. Sproles has been the main cause in the Eagles 2 comeback wins. The Redskins come to Philly on Sunday, the Eagles want to go 3-0 & hopefully not via the comeback, but the duo of McCoy & Sproles, the Eagles look good on offense. Lots of blown leads in Week 2, the Saints blew a lead in Cleveland & took a loss vs. the Browns, Jets blowing a lead in Green Bay & the Packers came back in the 3rd qtr & made the Jets pay, the Niners blowing a 17-0 lead vs. the Bears & the Colts blowing a 17 point lead vs. the Eagles. Not Good. Richard Sherman can be thrown at & beat, the Chargers were not afraid to challenge him, but more importantly the Chargers offense keep the Seattle defense on the field, a big key for the Broncos to use in there Super Bowl rematch this Sunday. The Jaguars, Raiders & Giants are really bad, the Jags Offensive Line is terrible, the Giants Offense as a whole is just bad & the Raiders are just bad all together outside of the Rookie QB. It’s looking like a long year in Jacksonville, Oakland & the Big Apple. The Buccaneers have shown us they are still not good, in 2 weeks the Bucs have lost at home to Backup QB’s Derek Anderson & Austin Davis, the Tampa 2 Defense looks like a fallen version of the Roman Empire. Bucs get only a couple days to prepare to play the Falcons on Thursay Night Football so 0-3 will not be in there future.